Context - Biocides are added to many consumer goods such as cosmetics and detergents to kill bacteria or inhibit their growth. They include disinfectants, preservatives as well as antiseptics and are widely used in animal husbandry, food production and health care. There is concern that this widespread use of biocides may lead to the emergence or proliferation of harmful bacteria that are resistant to both biocides and antibiotics. 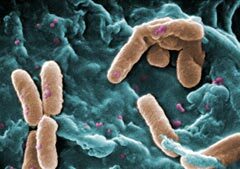 In the light of current scientific evidence, can biocides lead to antibiotic resistant bacteria? An assessment by the European Commission Scientific Committee on Emerging and Newly Identified Health Risks (SCENIHR). GreenFacts was contracted to prepare this summary by the DG Health and Consumers of the European Commission, which authorised its publication. See this publication on europa.eu. Text copyright© DG Health and Consumers of the European Commission. 1.4 Biocides need to be approved before they are released on the market. However, unlike antibiotics for which the use in humans and animals is carefully monitored, biocides can be used without any kind of monitoring. The total quantities of biocides produced and used in the EU remain unknown, although they are expected to be considerably greater than the total production of antibiotics. 2.1 In health facilities, biocides are indispensable to prevent and control infections. Disinfectants are used to decontaminate surfaces, instruments and the skin of patients and healthcare workers. Usually, the greater the infection risk the stronger the disinfection method used. Antiseptics are used to treat infections in surface wounds. Biocides are for instance included in cleaning products. Biocides are used when breeding and raising livestock. Biocides are discharged with wastewater. 4.1 Some bacteria are naturally unaffected by antimicrobial products. Other bacteria find ways to keep their inside concentration of biocides at levels that are harmless to them, for instance by limiting the amount that penetrates the cell or by pumping biocides out. Some bacteria can use enzymes to alter antimicrobial products or can modify their external envelope so that products cannot penetrate inside the cell. 4.2 Bacteria can become resistant to antibiotics as a result of spontaneous changes in their DNA (mutations) or a gene transfer from another bacterium. When different strains of bacteria are exposed to antibiotics, those that have resistance genes survive while the others are killed. Over time, this can lead to the selective survival of resistant strains, and to an increase of resistance. Biocides are used in hospitals to prevent and control infections. 6.3 Bacteria resistant to biocides are increasingly common in health care settings. More research is needed to investigate whether there is a link between biocide use in hospitals and emergence of antibiotic resistance. To date, evidence of such a link has only been found in some cases of antibiotics that are not currently widely used. Bacteria that grow as a biofilm are able to survive hostile conditions. 8.1 Different biocides act in different ways and some are more likely to lead to the emergence of resistant bacteria than others. The risk of spreading resistance genes depends on the type of bacteria involved, and is particularly high for bacteria that readily pass genetic information (DNA) to other types of bacteria. 8.2 It is very difficult to measure how effective antimicrobial products are, particularly in real life conditions. Humans have long used products with biocidal properties to effectively keep harmful micro-organisms at bay. Today, bacteria are becoming increasingly resistant to antibiotics and there is scientific evidence that the use and misuse of biocides such as disinfectants, antiseptics, or preservatives can contribute to antibiotic resistance. To date, the lack of precise data, in particular on quantities of biocides used, makes it impossible to determine which biocides create the highest risk of generating antibiotic resistance. the combined effects of all the different constituents of biocidal products, which could increase resistance. Standard methods to measure the ability of a biocide to induce resistance against biocides and antibiotics. Biocides are a precious resource that should not be used unnecessarily. When they are used, they should be applied in concentrations high enough to kill all the bacteria exposed and eliminate the risk of resistance.